Master limited partnerships pay high yields from income earned in the energy industry. These are the three best MLP ETFs designed to track portfolios assembled by top index providers Alerian and Cushing Asset Management. Master limited partnerships (MLPs) offer sky-high dividend yields earned primarily from the transportation of oil and gas. Although they're simple to buy individually, investing in a diversified portfolio of MLPs via index funds can be tricky, as obscure tax and fund laws require fund sponsors to jump through hoops to design workable sector funds. These three MLP exchange-traded funds (ETFs) and exchange-traded notes (ETNs) simplify tax complications and carry low expense ratios, making them the best MLP ETFs on the market today. Data source: ETF and ETN sponsors. Here's why these exchange-traded products earn a top spot in diversified MLP investments. The largest ETF in its industry, the Alerian MLP ETF is designed to simplify the process of investing in MLPs. This fund seeks to track the Alerian MLP Infrastructure Index, which is a portfolio of 25 MLPs that generate the majority of their cash flow from midstream activities in energy. The Alerian MLP ETF is market-cap-weighted, so the largest MLPs make up substantially more of its portfolio than smaller MLPs. As a result, the three largest holdings -- Magellan Midstream Partners, Enterprise Products Partners, and Energy Transfer Partners -- make up more than 30% of the portfolio on a combined basis. The Alerian MLP ETF operates as a corporation rather than a true fund, and thus it pays corporate taxes on the distributions received on its MLP investments. Distributions from the ETF to its shareholders are then taxed again as dividend income. The upside to its structure is that investors who own it receive a simple 1099 from the company at tax time, and do not have to file Schedule K-1 that can cause a headache for investors who are not familiar with the extra tax responsibilities that come with MLP investing. This fund's biggest advantage is also its biggest disadvantage. Because the fund pays corporate taxes on distributions, it has lagged the performance of its index considerably. Over the five-year period ended Dec. 31, 2015, admittedly a poor period for the MLP industry as a whole, the fund generated average annual returns of 0.64% versus 3.01% for the underlying index, due to corporate taxation on MLP distributions and, to a lesser extent, fees charged to the fund. So, while this is an excellent fund for tracking the changes in MLP share prices in the short-term, taxes on MLPs' dividends leads it to underperform its index over longer periods time. The next two products may be better-suited for investors who are interested in long-term return potential. The best MLP ETFs and ETNs track their index before and after tax. Image source: Getty Images. Though it isn't an ETF by definition, the JPMorgan Alerian ETN offers investors the ability to invest in a product that tracks the performance of the MLP industry. It tracks the Alerian MLP Index, which includes 44 companies and weights them by market capitalization, seeking to invest in companies that make up 85% of the industry's collective market value. Exchange-traded notes do not invest in stocks that make up the underlying index like ETFs do. They are simply notes issued by an issuing bank (JPMorgan Chase, in this case) that are designed to track the value of an index. In effect, an ETN is a debt security issued by a bank that trades on the stock market. Its structure as a note is important for several reasons. First, an exchange-traded note is only as good as the credit of the issuing bank, but JPMorgan's status as a "too big to fail" institution is comforting to many investors. Second, because it is an ETN, all of its distributions are taxed as ordinary income because the ETN is a debt security and thus its "dividends" are actually interest. Finally, because it is an ETN, you'll receive a simple 1099 form at tax time, rather than the Schedule K-1 you would receive from individual MLPs. Though the underlying index is a very popular index for MLPs, investors should note that the index is market-cap-weighted and float-adjusted, resulting in an index where a handful of MLPs drive the majority of its performance. Its top three holdings -- Enterprise Products Partners, Magellan Midstream Partners, and Energy Transfer Partners -- combined make up just over 39% of the index. Credit Suisse's premier MLP product is also an ETN, and thus it has all of the same tax and risk factors as the JPMorgan product. The primary difference is that this ETN is issued by Credit Suisse and tracks the Cushing 30 MLP Index, an equal-weighted index of 30 midstream MLPs. Stocks are picked for the index by a proprietary formula that selects companies based on fundamental metrics like cash flow generation. The real difference maker is how the underlying index works. The index weights all 30 stocks equally, and as a result the portfolio has significantly more small-cap exposure than other MLP ETFs and ETNs, as the index does not give preference to companies with larger market capitalizations. This ETN is inherently more volatile than other sector ETFs and ETNs. The chart below shows its price performance in comparison with those of the Alerian MLP ETF and JPMorgan Alerian MLP ETN over a recent five-year period. AMLP, AMJ, and MPN price change. Data by YCharts. When MLPs were red hot in 2014, Credit Suisse's MLP ETN rose faster than large-cap-dominated ETFs and ETNs. When investors turned cold on MLPs and the energy sector as a whole in 2015, it declined faster and to a greater degree than other ETFs and ETNs. This is typical of any investment with more small-cap exposure. A current annualized yield of about 6.5% makes this the lowest-yielding MLP ETF or ETN on the list, primarily due to its focus on smaller companies. It is thus a better holding for the investor who wants to own MLPs for capital appreciation resulting from fluctuations in energy prices, increased drilling activity, or the resulting increased demand for energy transportation. There are a few things you should know before diving headfirst into MLPs for their high dividend yields. First, although Kinder Morgan is largely viewed as the bellwether for the MLP industry, it changed its structure to a C corporation in 2015, and thus it isn't included in many MLP ETFs and ETNs. That might be fine if you're a purist about corporate structure, but although Kinder Morgan isn't structured as an MLP, its core business is very much MLP-like. Investors who want to own the whole industry might want to buy Kinder Morgan shares on the side. Second, the tax benefits that MLP investors enjoy from buying MLP shares (units) individually do not translate into ETFs or ETNs. When you own an MLP share directly, a portion of your distribution can be a return of capital, which reduces your cost basis and results in the deferral of taxes until you sell your shares of the MLP. Distributions from the Alerian MLP ETF are treated as dividends after a layer of corporate taxes, while income earned from shares of JPMorgan Alerian MLP ETN and Credit Suisse X-Links Cushing 30 MLP Infrastructure ETN are treated as ordinary interest income. 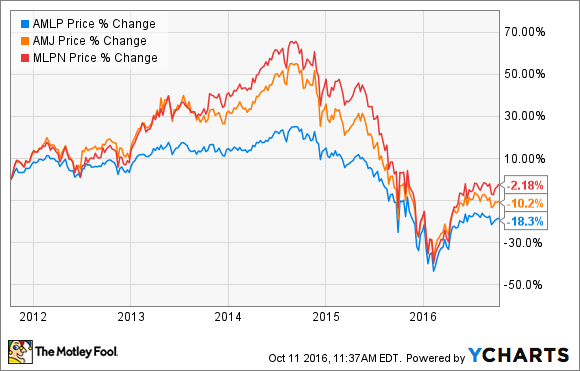 Put simply, MLP ETFs and ETNs negate many of the reasons why investors want to own MLPs in the first place. Investors who intend to hold MLPs for a long time would likely be better off owning a diversified portfolio of individual MLPs in a taxable account rather than an MLP ETF or ETN in a taxable or tax-deferred account like a 401(k) or IRA. Ultimately, it comes down to how much you're willing to pay for convenience. ETFs and ETNs make investing in MLPs much easier than investing in individual MLPs at the expense of some lost tax advantages. The Best Energy ETF of the Week: Time to Buy on the Dip?